:: Sponsored by: North Bennet Street School, Sprinkler Factory, Kingston Gallery, Newton Open Studios, Windows to the Woods: Tamara Gonda & Nancy French, Solomon's Collection and Fine Rugs, Vizivel, Artrageous!32, Trustman Art Gallery at Simmons College, Hampden Gallery, Augusta Savage Gallery, 6 Bridges Gallery and the Artscope Tablet Edition. This week we're presenting Violence Transformed, Addison Gallery of American Art, and the League of NH Craftsmen with exhibitions of works that command attention, whether by being thought-provoking, eye-catching, or both. There are other interesting and exciting events for those who want more. Artscope is sponsoring Artrageous!32, Monsterrat College of Art's annual auction fundraiser taking place on Saturday April 7 from 6:00pm - 10:00pm. Tickets are on sale now. 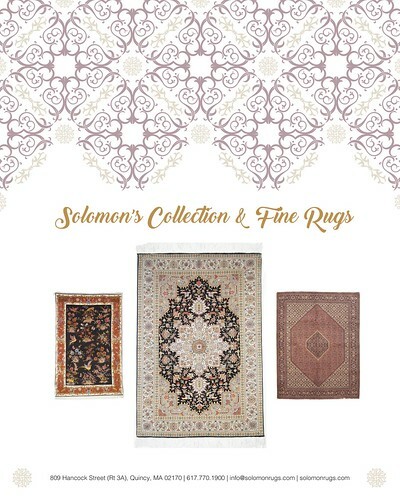 We are also sponsoring CraftBoston Spring, happening April 20 - 22 at The Cyclorama at Boston's Center for the Arts. For more information and to buy tickets, please visit the Society of Arts + Crafts's website. The May/June issue of Artscope will be at Art Basel Switzerland 2018, which is taking place June 14-17. 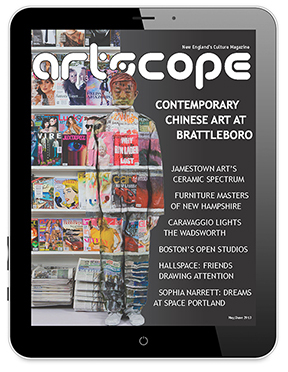 If you would like to advertise in the May/June issue, please contact us at advertise@artscopemagazine.com or call (617) 639-5771. The deadline to submit an ad is April 15. Violence Transformed is currently holding several art exhibitions in galleries throughout the Boston area. Violence Transformed is an annual series of visual and performing arts events that is currently in its twelfth year. Coordinator of Performing Arts Hope Ricciardi explains that Violence Transformed's exhibits "specialize in art addressing violence in the community." Said community can be almost anything. For example, there will be a closing reception tomorrow, March 23 at 5:00pm - 7:00pm for "Guns and Gun Violence: Too Many, Too Close," an exhibition at the Town Commons Gallery at Cambridge College about the impact of guns on American life. Currently on view through April 28 is "Women Against Violence: Resistance and Resilience" at Lesley University's Marran Gallery, an exhibition that uses art to address violence against women. From April 2 through June 4 is "Violence Transformed: STAND UP" at Harriet Tubman House, which responds to violence in local, national, and international communities across political, racial, religious, and other boundaries. From April 9 through April 22, "Ubuntu Today: The Youth Speak" will be showing at Towne Art Gallery at Wheelock College. This exhibition is part of an ongoing initiative of the Youth Justice and Advocacy Undergraduate Program at Wheelock College and was created in collaboration with the youth programs in the Ubuntu Arts Youth Project. All of these exhibitions urge the viewer to consider the effects of violence in their own communities as well as consider what they can do to begin mitigating those effects. For more information on Violence Transformed and its exhibitions for March and April, please visit violencetransformed.com/events. Sponsored by: North Bennet Street School, Sprinkler Factory, Kingston Gallery, Newton Open Studios, Windows to the Woods: Tamara Gonda & Nancy French, Solomon's Collection and Fine Rugs, Vizivel, Artrageous!32, Trustman Art Gallery at Simmons College, Hampden Gallery, Augusta Savage Gallery, 6 Bridges Gallery and the Artscope Tablet Edition. Artists Cindy Crimmin, Dave Kaphammer, Catherine Meeks, Maryann Mullet, Diane Reed Sawyer, and Janet Schwartz join forces in this exhibition. Through their work the artists tell a story, make a statement, or offer a perspective that is uniquely their own. The result is an exhibition rich in contrast and connection. 38 Harlow St. Worcester, MA 01605. The beauty of the natural world is not lost on these two artists. The peaceful wooded scenes painted by Tamara Gonda are perfectly complemented by the graceful curved branches in the sculptural pieces hand crafted by Nancy French. Celebrate spring with a visit to this exhibit. Addison Gallery of American Art is featuring "Gun Country" from now until July 31. This exhibition looks at representations of firearms in the Addison's own collection as a way of analyzing the historical origins of America's fascination with guns, one that persists into the modern era. Presented in the Museum Learning Center, "Gun Country" is organized by the Addison Gallery of American Art and curated by Stephanie Sparling Williams, Assistant Curator and Visiting Scholar. It is accompanied by "Speaking of Guns," a sound art installation created in collaboration with Phillips Academy students. The objects in "Gun Country" are being shown together for the first time, inviting discussion on the cultural significance of guns in America and how it has remained strong through the years. In a time when guns are a pervasive and sometimes polarizing topic of discussion in America, "Gun Country" is a timely examination of how it all began. Addison Gallery of American Art is located on the campus of Phillips Academy at the corner of Route 28 [Main Street] and Chapel Avenue in Andover, Massachusetts Tuesday - Saturday 10:00am - 5:00pm, and Sunday 1:00pm - 5:00pm. The museum is closed on Mondays, national holidays, December 24, and the month of August. Admission to all exhibitions and events is free. The Addison Gallery also offers free education programs for teachers and groups. For more information, call 978-749-4015, or visit the website at addison.andover.edu/Exhibitions/GunCountry. From now until March 28, The League of NH Craftsmen Craft Center is showing "Black and White Encore," a multi-media exhibition showcasing work by League juried members. The League challenged its members to create fine craft in black, white, and gray, with an additional pop of color if desired. This prompt created a wide variation of works, including photos, sculptures, wearable art, and more. As League Standards Manager Catherine Green says, "Each craftsman has a unique interpretation of the theme and the overall effect is stunning - it is a must-see exhibit." The Craft Center is located at 49 South Main Street, Suite 100 in Concord, New Hampshire and is open Monday - Saturday 10:00am - 4:00pm. For more information, please visit nhcrafts.org/events-gallery-exhibition.php. Recent paintings and sculpture by Alicia Hunsicker, drawings by Ben Sears and sculptural works by Fafnir Adamites. A global array of visual artists offer their art and accompanying words on the subject of home. Plus a free one-week performance series of music, dance, readings, and discussions at 7:00pm. More at fineartscenter.com/augusta.